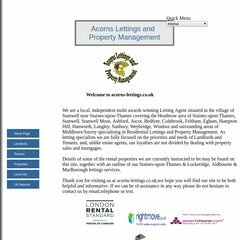 acorns-lettings.co.uk Acorns Lettings - The premier choice for lettings and property .. It is hosted by Group Nbt Plc Commercial Internet Services Provider (England, London,) using Apache/2 web server. There are 2 Nameservers, dns1.easily.co.uk, and dns0.easily.co.uk. Its local IP address is 212.53.64.81. PING www. (212.53.64.81) 56(84) bytes of data.